Dr. Angelo Thrower’s MedSpa in Miami Shores has been helping all types of ethnic skin achieve their best look for years and years. From dermaplaning and acne surgery for those with discoloration and pesky blemishes, to cosmetic surgery and facials to help keep the skin firm and hydrated, to even skin lightening, Dr. Thrower’s staff delivers the results his clients need with safe and efficient procedures. Skin lightening for dark spots, scarring, and more used to only be achieved with skin peels or out-patient laser services. Now, Dr. Thrower is breaking the mold with an over the counter skin lightening capsule! This product is perfect for discoloration issues or stretch marks that just won’t quit. With consistence use of the Glutathione capsules, results can be seen in just a few months. Costumers rave that is product works where other products failed them, and that these tablets will not only have you looking your best, but feeling your best. 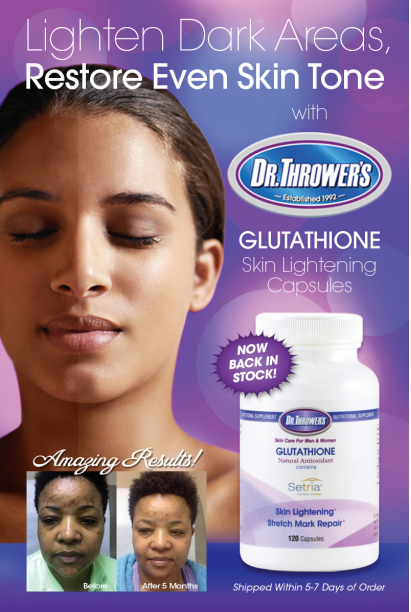 Order a bottle of Glutathione and see for yourself! For more information about Dr. Thrower’s MedSpa and his products visit his official Facebook and Twitter Pages.